The Newlands Clinic team will not forget 9 January 2019 any time soon, as it was the day that Swiss Federal Councillor Ignazio Cassis toured our clinic as part of his visit to southern Africa. The foreign minister appeared impressed and emphasised the important contribution that Newlands Clinic is making to the fight against HIV/AIDS. After the visit he went on to meet with Zimbabwean Minister of Health and Child Care Obadiah Moyo. Minister of Health and Child Care Obadiah Moyo and Swiss foreign minister Cassis. Patient Rumbidzai, 54, said after speaking to the Swiss foreign minister: “without Newlands Clinic I would have died. They’ve given me a second chance at life. I’m happy and feel very honoured that the Swiss foreign minister was interested in my story. With the support of the SDC, in the autumn of 2018 Newlands Clinic successfully conducted an international pilot course for specialists from countries of the South African Development Community (SADC). Some 38 % of people with HIV/AIDS live in these countries. In a two-week course, 20 nurses from Botswana, Lesotho, Malawi, Namibia, Swaziland and Zambia were taught theoretical knowledge and received practical insights into HIV management at Newlands Clinic. The SDC is evaluating the possibility of further international courses. To date, Newlands Clinic has trained around 3,400 specialists from all over Zimbabwe. 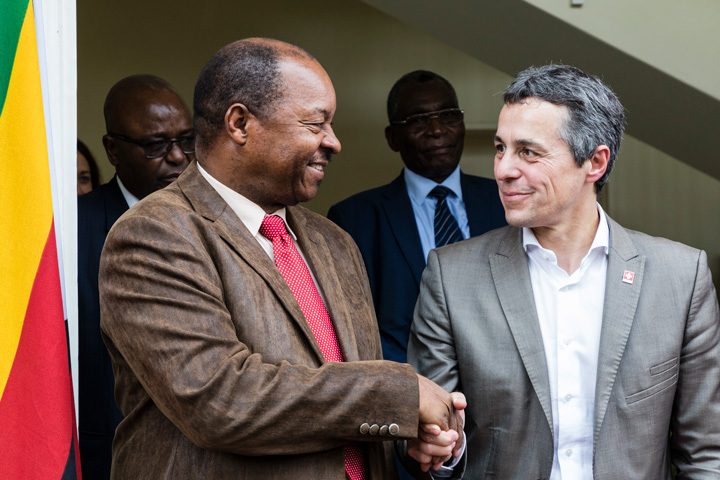 After touring the clinic, Foreign Minister Cassis had a personal meeting with Zimbabwean Minister of Health and Child Care Obadiah Moyo. He then immediately travelled on to a two-day state visit to South Africa.